Ahhh, your long-awaited beach holiday has finally arrived. The chance to fill a few, glorious days with nothing but sun, surf and laid-back beach runs. Because what could be better than a sunrise run with the waves crashing in the background, right? Or a refreshing post-run dip in the ocean? Frankly not a lot. In fact, running on the beach in a summery, exotic location is many a runner’s idea of absolute bliss. And while most runners can think of at least a handful of benefits of running on the beach, a few grey areas also spring to mind. Does jogging on the beach put too much pressure on your joints? And will running on the slanted beach surface lead to injuries? Here’s everything you need to know about the pros and cons of that blissful beach run. Running on soft sand requires roughly 1.6 times more energy than running on a hard surface. Two main factors contribute to this phenomenon: An (1.15-fold) increase in mechanical work done on soft sand, and a decrease in the efficiency of muscles and tendons on a soft surface. And while all of this might sound negative, it means, in short, that you get more bang for your (training) buck. If you do it wisely, that is. In fact, many athletes use beach running as a form of speed- and strength training, especially in areas where hills are few and far between. Dr R.A. Mason, Assistant Professor of Orthopedics and Physical Medicine and Rehabilitation at Emory University, for example, says that regular beach runners who return to running on tar roads tend to move more quickly. He attributes this to the fact that they experience less drag on the roads than what they’ve become accustomed to on the beach. Regular beach running also strengthens the smaller, stabilizing muscles in both your feet and ankles. For many road runners these muscles are week, since they’re rarely put into action on paved roads. Strengthening these muscles through (clever and disciplined) beach running could help protect against potential future muscle imbalances and injury. The benefits of running in nature are many and varied. In addition to the more well-known physiological benefits of running, running on the beach may improve mental well-being, boost self-esteem, alter your perception of effort and lead to increased activity in senior runners. So what are you waiting for?! A 1998 study by a team from Griffith University concluded that barefoot running in loose sand results in pronation occurring earlier and lasting longer with each footfall. This leads to increased pressure on both the ankle and knee joints, which, in turn, could potentially result in an increased susceptibility to injury in these joints. The ability of thick sand to allow for increased pronation may also lead to an increased incidence of shin splints in runners. The impact of soft sand on the foot’s normal running motion has some other potentially negative consequences as well. The calves tend to work a lot harder to normalize the foot’s running motion on a shifting, uneven surface, even more so for heel strikers. This may, over time, lead to injury if the body isn’t given sufficient opportunity to get used to these changes. And since the smaller, stabilizing muscles in the lower legs and feet are often weak in road runners, these may also be at risk of injury if a sudden, all-or-nothing switch is made to running in soft sand. Running on a slanted surface can wreak havoc on knees and hips. And since very few beaches are 100% level, repeated training on this surface may lead to niggles and injury. Ease into it. Use beach running as a supplement to your regular running at first. Give your body a chance to adapt to the rigors of beach running by slowly increasing the time you spend running on the beach. Do not attempt to substitute your regular road running distances for beach running distances in one go. 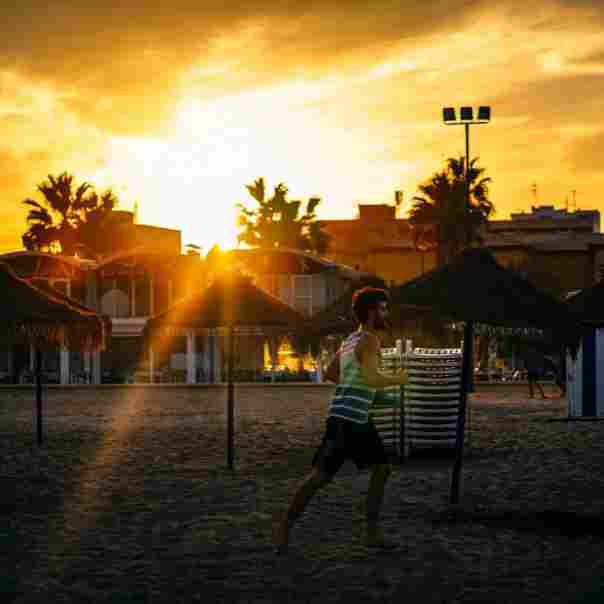 Focus on keeping your beach runs short at first and then slowly increase the time spent running on sand over time. Forget about your pace. As mentioned before, it takes 1.6 times more energy and 1.15 times more mechanical work to run on sand. So don’t expect your pace to stay the same when transitioning to sand. Run during low tide and stick to the water’s edge. The packed sand at the water’s edge will give you a good workout, but cause less strain than thick, dry sand. The surface is generally also less slanted closer to the water’s edge. Mix things up. Try not to run on the beach every day. Challenge your body and save your joints by alternating between road-, trail and beach runs. Keep your shoes on if you normally run with shoes. Beach running and barefoot running both challenge the body in a number of new and different ways. Transitioning from regular road running to both beach- and barefoot running in one go is therefore not just unwise; it could significantly increase your chance of injury. There is, of course, also the issue of glass shards, sharp sticks and the like. These items could put an abrupt end to your run if going barefoot. Run out and back. A slanted surface isn’t ideal for running. Period. But if you have to run on a slightly slanted beach, it’s believed to be best to put both legs through the motions, and not just one. So instead of covering a long distance point-to-point in one direction, rather split it in half and run each half in opposite directions. Stop immediately if you feel knee or hip pain and take the road or a level trail path home. Be blister savvy. Sand grains are bound to find their way into your running shoes, no matter how well they fit. Avoid chafing by lubing up those feet and wearing tight, above-the-ankle moisture-wicking socks. Keep your eyes peeled. 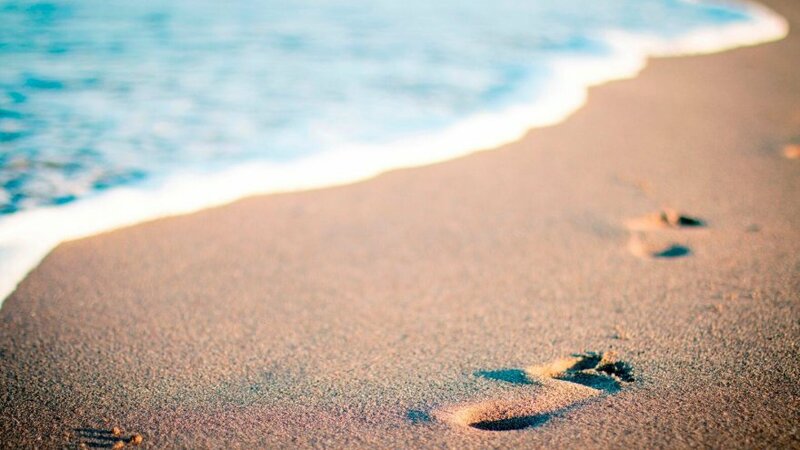 Avoid tripping over or stepping into holes an sandcastles, especially if you’re running at dusk or dawn. Show up prepared. Beaches are synonym with strong winds and a lack of shade, so be prepared. Wear sunscreen, a cap and sunglasses, flip flops and be sure to carry water with you or stash it away en route. So while there are some risks involved with beach running, it could also be a valuable training tool if approached correctly. And, as a bonus, you’ll be reaping the additional benefits of training in nature too! The crux of the matter is to ease into it, listen to your body and put safety first. 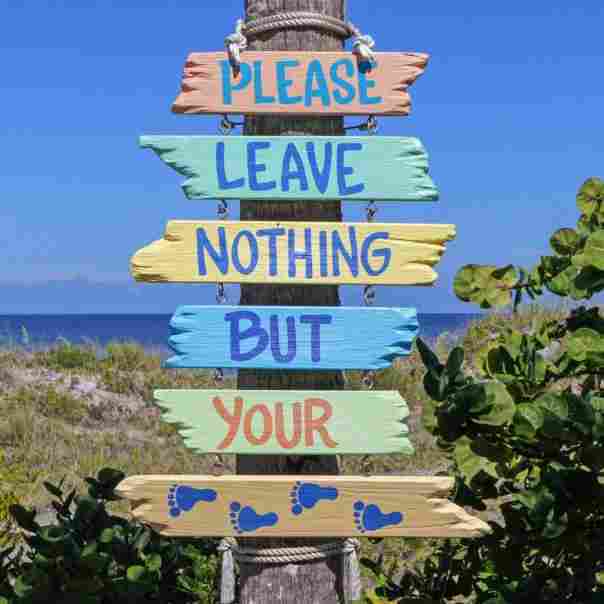 Stick to these simple guidelines and who knows; you might just return from your holiday stronger than ever!